Multi-word terms (MWTs), in the form of noun compounds (NCs), are frequently used in specialized texts (Nakov 2013). They consist of juxtaposed terms with underlying semantic structures that limit the combination of arguments (Pinker 1989). However, NCs formed by more than two terms have received little attention. This study focused on English and Spanish three-term endocentric NCs used in Coastal Engineering. 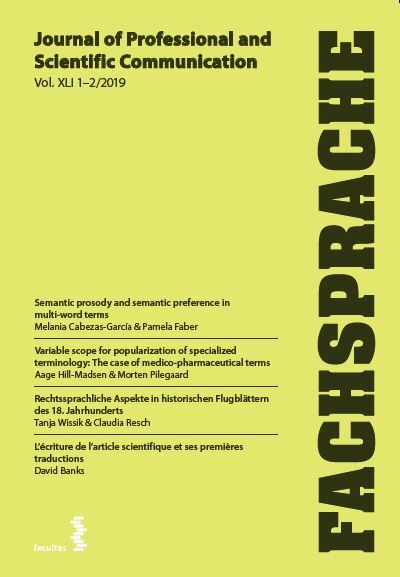 To explore the presence of semantic preference and semantic prosody in these MWTs, a set of terms was extracted from a Coastal Engineering corpus. The structure of the MWTs was disambiguated and the semantic relations between their components were specified. Verb paraphrases were also elicited from field experts and the web, and then semantically analyzed. The results showed that semantic preference and semantic prosody play an important role in the formation of MWTs and should be taken into account when rendering a text into another language. Cabezas-García, Melania, und Pamela Faber. 2019. Semantic Prosody and Semantic Preference in Multi-Word Terms. Fachsprache 41 (1-2), 2-21. https://doi.org/10.24989/fs.v41i1-2.1598.